I have been doing lots of painting and I am always looking to improve my painting skills for painting both my home (walls, trim, cabinets, etc) and tips for painting furniture! I have been gathering some tips here and there so I thought I’d share those with ya! You are tackling your painting projects riiiiight?? Pretty soon it is going to get too cold to spray paint so I’ve been trying to get getting all of mine done! When painting dipping your brush straight into a paint can! This is great for hand painted furniture projects! 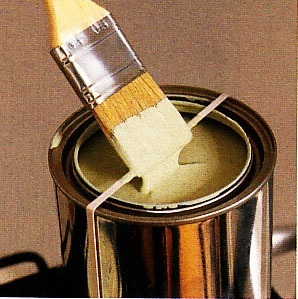 Place a rubber band around the open can so you can wipe the excess paint off the brush! This keeps things looking tidy and makes clean-up a breeze! I LOVE this trick! You don’t need to worry about buying a badillion painting tray liners when you are painting! Like when you move into a place and have painting list a mile long… not that I do or anything… ahem. 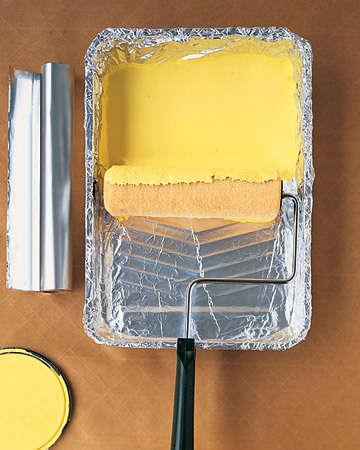 All you have to do is line your tray with heavy duty aluminum foil and paint away! When you’re done, just pour your excess back into the paint can and throw the foil out! Easy peasy! This is SO helpful when you have multiple colors to paint in your home! Seriously, LOVING this tip! When taping things off, use a tiny amount of paint on your brush (dry brush technique) over your tape to create a seal to prevent bleeding! Let this super light coat dry completely then do your regular coat. Peel off the tape before it dries so none peels up when you remove it. 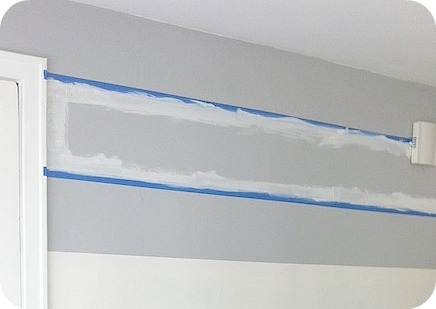 This worked WONDERS on my horizontal wall stripes. Wonderful tips! I’m loving the rubber band one! Pinning this for future reference 😉 Thanks for sharing!